TRAILER DE ECLIPSE EN REMEMBER ME MARZO 12!!! El trailer de Eclipse sera presentado con la pelicula de Remember Me donde aparece Robert Pattinson el 12 de marzo, es posible que tengamos algo antes de esa fecha asi que seguiremos de cerca esta noticia. DE NEW MOON LO ANTES POSIBLE !!! NUEVOS STILLS DE ECLIPSE FELIZ SAN VALENTIN !!! Me quede sin palabras ..... pero Feliz San Valentin !!! This Ultimate Fan Edition with collectible Lenticular Packaging includes a 7-minute sneak peek of "The Twilight Saga: Eclipse" which begins with an exciting behind-the-scenes look at the production of the newest film in the franchise. New interviews with stars Robert Pattinson, Kristen Stewart and Taylor Lautner, as well as with series-creator Stephenie Meyer are integrated with revealing, on-the-set footage of some of the key scenes and sets from the upcoming movie. This first-look at "The Twilight Saga: Eclipse" then concludes with the world premiere of an actual scene from the film between Bella and Edward that will surely have "Twilight" fans swooning. "Twilight Saga: New Moon" - Bella Swan is devastated by the abrupt departure of her vampire love, Edward Cullen but her spirit is rekindled by her growing friendship with the irresistible Jacob Black. Suddenly she finds herself drawn into the world of the werewolves, ancestral enemies of the vampires, and finds her loyalties tested. 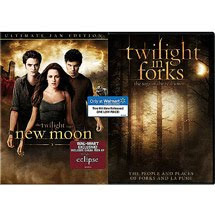 "Twilight In Forks" - The definitive DVD documenting the town of Forks made famous by the "Twilight" books and movies. Since the "Twilight" movies weren't filmed in the real Forks, this is your opportunity to see the town that Stephenie Meyer based her epic teen romance books on. Are there truly vampires and werewolves there? Hear from the real people living their lives in the town fans know and love, including the Chief of Police, the Forks Outfitters' employee who gets mistaken for Bella, and the vampire transplant who plays the real-life role of Alice. Visit Forks High School, hear self-described Jacob's grandfather tell the legend of how the Quileutes descended from wolves, and see many more of the people and places that make Forks and La Push the perfect setting for the "Twilight Saga". Subtitles: English SDH & Spanish. ¡¡¡ ADQUIERELA CON NOSOTROS ANTES DE QUE SE AGOTEN !!! NEW MOON ULTIMATE FAN EDITION DVD CON 7 MIN DE ECLIPSE !!! With the new movie and 50 minutes of extra footage and interviews, The Twilight Saga: New Moon Ultimate Fan Edition also contains an exclusive, 7-minute sneak peek of The Twilight Saga: Eclipse. It begins with an exciting behind-the-scenes look at the production of the newest film. Bella Swan is devastated by the abrupt departure of her vampire love, Edward Cullen but her spirit is rekindled by her growing friendship with the irresistible Jacob Black. Suddenly she finds herself drawn into the world of the werewolves, ancestral enemies of the vampires, and finds her loyalties tested. Director Commentary, Audio Commentary, Documentary, Music Videos. Subtitles: English SDH & Spanish, A Riveting 6-Part Documentary That Takes You Behind The Scenes, Exclusive Band Rehearsal Footage with Muse. The Twilight Saga New Moon 3 Disc Deluxe Edition DVD with Bonus Collectible Film Cell. Included in this edition are the 2 Disc Special edition plus a third disc of never before seen content and a bonus collectible film cell- check back for further details. 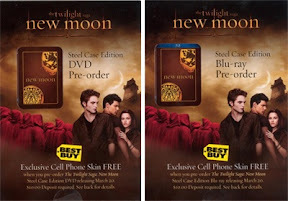 2 Disc Special Edition contains over 70 minutes of special features including: revealing feature length commentary with Director Chris Weitz and Editor Peter Lambert; a riveting 6-PART DOCUMENTARY that takes you behind the scenes (Part 1: Life After Twilight; Part 2: Chris Weitz takes the helm; Part 3: The Subtle Details; Part 4: Time to Shine; Part 5: Tricks of the Trade; Part 6: Ready for the World); Band Rehersal Footage with Muse; and Music videos from Death Cab for Cutie, Anya Marina, and Mute Math! In the second chapter of Stephenie Meyers best-selling Twilight series, the romance between mortal Bella Swan (Kristen Stewart) and vampire Edward Cullen (Robert Pattinson) grows more intense as ancient secrets threaten to destroy them. When Edward leaves in an effort to keep Bella safe, she tests fate in increasingly reckless ways in order to glimpse her love once more. But when shes saved from the brink by her friend, Jacob Black (Taylor Lautner), Bella will uncover mysteries of the supernatural world that will put her in more peril than ever before. NUEVAS FOTOS DE ECLIPSE Y REMEMBER ME !! Aqui les dejo las nuevas imagenes de Eclipse, me encantaron y bueno ya que nunca es suficiente les dejo las de Remember Me tambien!!! Recuerda apartar tu DVD de New Moon con nosotros !!! PROXIMOS NUEVOS PRODUCTOS DE NEW MOON!!! Hay que emprezar a ahorrar ya que vienen muchisimos nuevos productos con el lanzamiento del DVD de New Moon, y por si no fuera suficiente tenemos ya Eclipse a la vuelta de la esquina !!!! ¡¡¡ Si deseas algun producto por favor contactanos !!! Tenemos otra edicion del dvd esta viene en caja metalica y traera in skin para celular exclusivo. Aparta la edicion que quieras con nosotros!!! Llego la esperada version Borders, apartala con nosotros cuanto antes!!! Exclusive packaging that compliments our existing Borders Exclusive Twilight packaging. Exclusive medallion necklace ? gold side with wolf-pack tattoo, silver side is the Cullen crest on a silver chain. 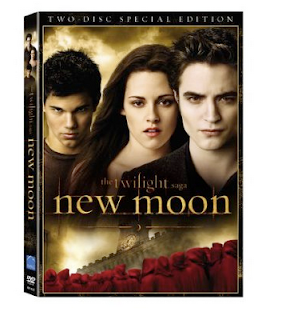 Includes previously unreleased EXTENDED SCENES; INTERVIEWS with cast members Robert Pattinson, Kristen Stewart, Taylor Lautner, The Cullen Family, The Wolf Pack, The Volturi and Director Chris Weitz; unrivaled RED CARPET FOOTAGE from the movie premiere; front row seats to The Twilight Saga: New Moon WEBCAST.